Nutty is David’s horse, who stays in the stables at Grandpa Hayden’s house. When Grandpa Hayden confronts Wesley about the arrest of Frank, Wesley tells David he can never let Grandpa in the house ever again. Wesley cries, not because his family had been ripped apart, or because his relationship with his grandfather has forever changed, but because he fears he will never see Nutty again. This is, however, not a trivial impulse on David’s part—Nutty is a figure for childhood itself. The horse had enabled David’s exploration, his long walks, hunting and fishing expeditions, and imaginary adventures. When David mourns the loss of Nutty, he is not merely mourning a pet, but sorrowfully acknowledging that his life will never be the same as it once was, that his childhood as it was will never return. The timeline below shows where the symbol Nutty appears in Montana 1948. The colored dots and icons indicate which themes are associated with that appearance. Winner, Kathryn. "Montana 1948 Symbols: Nutty." LitCharts. LitCharts LLC, 17 Jun 2015. Web. 21 Apr 2019. Winner, Kathryn. 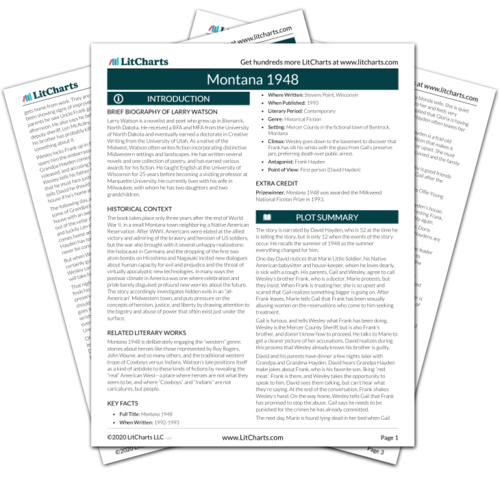 "Montana 1948 Symbols: Nutty." LitCharts LLC, June 17, 2015. Retrieved April 21, 2019. https://www.litcharts.com/lit/montana-1948/symbols/nutty.